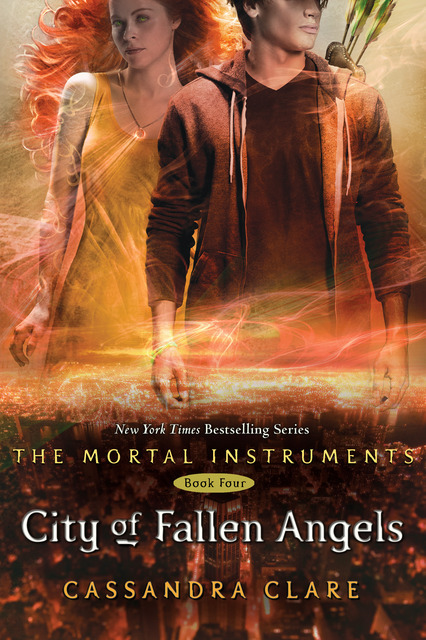 I feel like I should point out, before beginning my review, that it has been awhile since I read the first three books in the series so I felt a little lost and confused at the beginning of City of Fallen Angels. That did not change my enjoyment of the book though! I still loved it! I really wanted to re-read the first three before I jumped in to the fourth book but I couldn't contain my curiosity! I wanted to find out why everyone seemed to be going crazy over the ending! I particularly liked that Simon seemed to shine in this installment. I liked Simon before but now I love him! He really decides to finally come to terms with the fact that he's a vampire and that he will never be a normal human teenager again. Plus there is some exciting developments on the love front for Simon and I think he deserves that. We learn more about Maia which I like because I really like her as a character. I like that there is some small talk about a certain character from The Infernal Devices. I won't say who because I want it to be a surprise when you read it, if you haven't already. City of Fallen Angels was just as good as the other books but didn't out shine them. The only problem I had was that there seemed to be A LOT of different stories trying to form one plot. I understand having different subplots for the different characters but there were way too many to keep track of. I felt that as soon as we were developing something with one subplot we were thrown into another one, which is a device that authors often use to keep readers reading the book. I felt like there should have been more of a focus on one plot with minor sprinkling of the other plots. We didn't see a whole bunch of Magnus and Alec but I loved what we did get! The ending! This is the part that seems to be throwing everyone into a tizzy! I can completely understand why! It's insane! I started writing this review hoping I could say something profound that would accumulate everything I felt after ending this book (I even wrote the review a day after I read it hoping something would come to me), but there are no words that can describe the anger, surprise, awe, sadness, fright, and bewilderment that was the end of the book. If you think of a word that would fit that category, please share! Overall, a great book and if you haven't read it yet you should! Love, Love , LOVE THIS SERIES. The ending killed me too though, I HATE waiting for books to come out, but since i always get them the day they're released i always am waiting for the next one to arrive. Argh! I read the first three and was just going to call it good. I didn't love them enough to want more but now that you say this had more Simon...Sigh! This has way more Simon than the other ones! He plays a huge role in this book.